In 1915, the Children’s Home of Winnipeg acquired this nearly 10-acre Tuxedo site to better support its child welfare work in the city, replacing their previous and much smaller 198 River Avenue location. Based on the designs of local architect John Hamilton Gordon Russell, two buildings were erected by the Hazelton and Walin Company Limited along Godfrey Avenue [now Academy Road] to support their philanthropic efforts in caring for single parent, orphaned, and abandoned children. During the First World War, the Home also housed children of soldiers serving overseas. The cornerstone was laid at a ceremony on 15 June 1915 and later officially opened by Mayor Richard Deans Waugh on 18 March 1916 before a crowd of several hundred residents. Stone used in the construction was sourced from the Wallace Sandstone Quarries. The main building hosted girls quarters, while boys and infants each had their own sections within the adjacent structure, with the costs of completion being around $125,000. School classes were housed in these structure until a separate building was established on the Home grounds two years later. In the fall of 1918, the provincial government funded the construction of a school at the site, later named for one of the Home’s early directors, Julia Jane Murray Clark in 1920. Designed by Winnipeg school architect J. B. Mitchell, the two-storey, four-classroom school cost $19,400 and was built by the firm of Fraser and Macdonald. 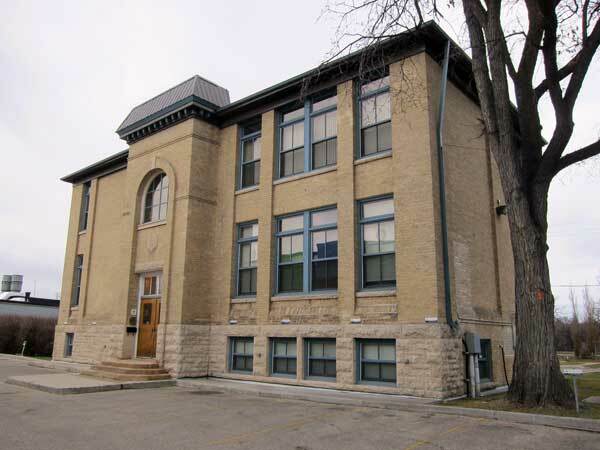 It was not, in the strictest sense of the word, a public school although the Winnipeg School Division covered its operating costs and provided its teaching staff, and local children did attend the school, at least until Sir John Franklin School was constructed nearby, in 1921. A library was maintained at the Home by the Winnipeg Teachers’ Club, and named in memory of Anna Gibson. In February 1945, the Home moved to a new building on Assiniboine Avenue. The former buildings were occupied by Department of Veterans Affairs, as an annex to its convalescence hospital at Deer Lodge, in St. James. They occupied the site until 1958 when it became the Assiniboia Indian Residential School, which operated until June 1973. During this period, a gymnasium was added to the south side of the school building. Parks Canada used the facility for artifact storage from 1972 to 1993. The dormitories of the former Home were demolished in the early 1980s and replaced by an RCMP forensic science laboratory. Fittingly, as of late 2011, the former school building is the headquarters of a national child welfare organization. It is a municipally-designated historic site. There are extensive records for the Children’s Home of Winnipeg at the Archives of Manitoba. Source: “Centre building of new Children’s Home,” Winnipeg Tribune, 9 June 1916, page 6. 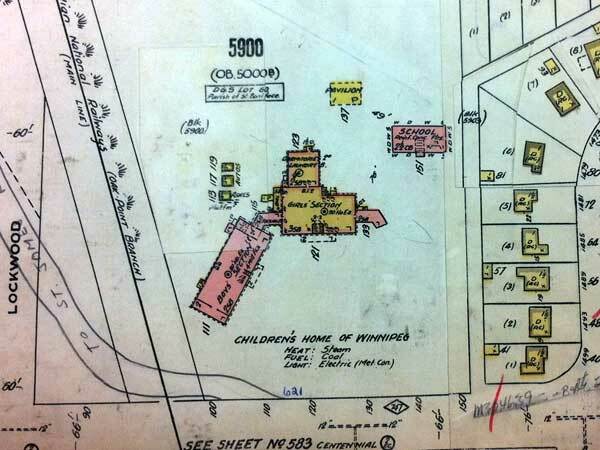 Portion of a fire insurance map showing the campus of the former Children’s Home of Winnipeg and Julia Clark School (circa 1927). Winnipeg, Volume 5, Sheet 590, January 1927. “To erect $65,000 Children’s Home,” Winnipeg Tribune, 31 May 1915, page 9. “Children’s Home is going up,” Winnipeg Tribune, 1 June 1915, page 5. “Will build new Children’s Home,” Winnipeg Tribune, 5 June 1915, page 7. “Announcements,” Winnipeg Tribune, 13 June 1915, page 6. “Build new wing, Children’s Home in Tuxedo Park,” Winnipeg Tribune, 13 June 1915, page 9. “Cornerstone of new Children’s Home laid this afternoon,” Winnipeg Tribune, 15 June 1915, page 6. “Children’s Home to be dedicated here on Saturday,” Winnipeg Tribune, 17 March 1916, page 5. “The Children’s Home,” Winnipeg Tribune, 20 March 1916, page 4. “Reduce staff of teachers at high schools Monday,” Winnipeg Tribune, 18 August 1916, page 1. “Winnipeg teachers are assigned for new term,” Manitoba Free Press, 25 August 1917, page 13. “Happy family of youngsters lives at Children’s Home,” Winnipeg Tribune, 6 October 1917, page 21 and 22. “To contractors,” Winnipeg Tribune, 24 August 1918, page 2. “To erect school,” Winnipeg Tribune, 29 August 1918, page 4. “Teachers are selected for various grades,” Winnipeg Evening Tribune, 29 August 1919, page 3. “Sacrifices by school staff members are to be commemorated,” Winnipeg Evening Tribune, 12 March 1920, page 7. “Board appoints 817 teachers to schools in city,” Winnipeg Evening Tribune, 30 August 1921, page 2. “905 teachers will instruct city pupils during next term,” Winnipeg Evening Tribune, 1 September 1922, page 6. “Winnipeg schools, No. 35—Julia Clark,” Manitoba Free Press, 25 November 1922, page 10. “Teachers assigned,” Winnipeg Evening Tribune, 31 August 1923, page 3. “Teachers are assigned to city schools,” Winnipeg Evening Tribune, 30 August 1924, page 6. “[Winnipeg school teaching assignments - page torn, title not present],” Winnipeg Evening Tribune, 31 August 1925, page 19. “Teachers are assigned for new term in public schools,” Winnipeg Evening Tribune, 30 August 1926, page 7. “Important changes made in teachers’ assignment,” Winnipeg Evening Tribune, 30 August 1927, page 2. “City Schools to open Oct. 1; teachers given assignments,” Winnipeg Evening Tribune, 26 September 1928, page 2. “Public schools will reopen here Tuesday,” Winnipeg Evening Tribune, 2 September 1929, page 2. “Large increase in number of High School pupils expected,” Winnipeg Evening Tribune, 30 August 1930, page 8. “40,000 pupils to hear school bell Tuesday,” Winnipeg Evening Tribune, 29 August 1931, page 21. “School Board announces allocation,” Winnipeg Evening Tribune, 30 August 1932, page 5. “Winnipeg’s school pupils return to their studies today after long holiday,” Winnipeg Free Press, 5 September 1933, page 6. “Teachers for local schools are assigned,” Winnipeg Evening Tribune, 1 September 1934, page 4. “Children’s Home of Winnipeg makes plans for celebrating golden jubilee next Saturday,” Winnipeg Evening Tribune, 12 January 1935, page 10. “Assign teachers to posts,” Winnipeg Free Press, 31 August 1936, page 21. “Anna Gibson School to remain closed when new term starts,” Winnipeg Free Press, 31 August 1937, page 10. “School starts Thursday; teachers are assigned,” Winnipeg Free Press, 31 August 1938, page 20. “Winnipeg teaching personnel is announced for new term,” Winnipeg Free Press, 2 September 1939, page 18. “Back to school,” Winnipeg Free Press, 31 August 1940, page 13. “School opening,” Winnipeg Free Press, 5 September 1941, page 7. “Winnipeg teacher appointments are published by School Board,” Winnipeg Free Press, 29 August 1942, page 12. “Public school assignments of teachers are announced,” Winnipeg Free Press, 30 August 1943, page 8. “School bells will ring again in Winnipeg Tuesday morning,” Winnipeg Free Press, 3 September 1944, page 6. Obituary [Selma L. Malmgren], Winnipeg Free Press, 15 October 1957, page 9. Obituary [Katherine Gowenlock], Winnipeg Free Press, 2 October 1969, page 37. Marriage registration [Gowenlock], Manitoba Vital Statistics. Former Julia Clark School, 611 Academy Road, City of Winnipeg Historical Buildings Committee, August 1997. Children’s Home of Winnipeg fonds, Annual Reports, Archives of Manitoba. We thank Randy Rostecki for providing additional information used here.